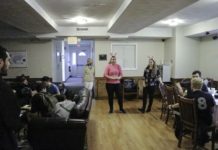 The University of Rhode Island’s Office of International Education kicked off their International Education Week, initiated by the U.S. Departments of State and Education with Taste the World, an international food celebration in the Rainville Ballroom, Memorial Union. The event was free and open to the public featuring food and drinks from a variety of countries and locations including America, Asia, Caribbean, India, Japan, Mediterranean and Mexico as well as paid specialty food trucks. There were also stations that talked about different languages and provided information on options for study abroad. The event was started in 2012 when the University first initially hung the flags of URI students. The Ballroom was decorated with the 135 different flags, each to represent the heritages of current URI students. This year welcomed the new flags of Guyana, Hong Kong, Malawi, the Maldives and Tunisia. 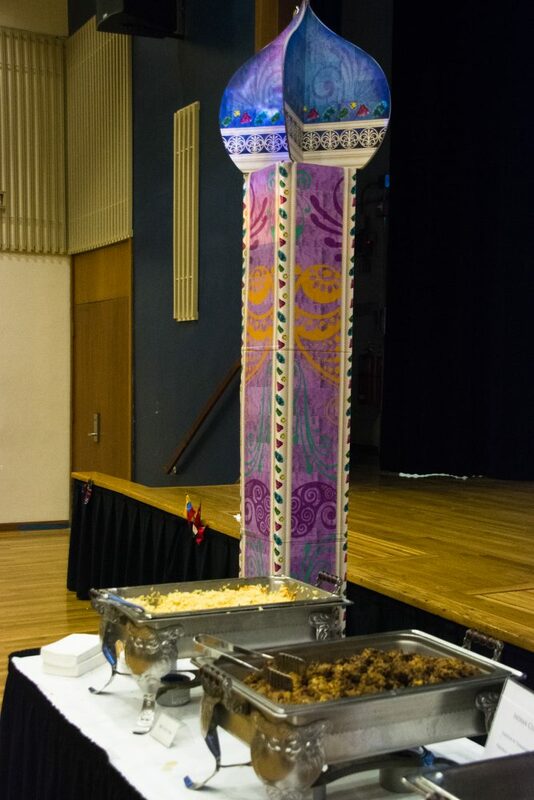 When walking in, each country or location had their own table and decorations with a variety of food samples to try. The American table included iced water and hot and cold apple cider. The Asian cuisine table had vegetable egg rolls, sesame asian noodles and thai chicken skewers. The Caribbean cuisine table contained fruit skewers with a lime dip and fried plantains. The Indian cuisine table contained samosas with a tamarind chutney, pakoras, or vegan indian fritters, and red curry rice. The Mediterranean cuisine table contained spanakopita, or Greek spinach pie, grape leaves with feta cheese and olives and pita chips with hummus. The Mexican cuisine table contained tortilla chips with salsa and guacamole and beef empanadas. Not only were there buffet samples, but there was also paid specialty food truck vendors: Buddy Belly, O’Crepe and Mamitas. Buddy Belly is an authentic chinese food truck that hopes to “offer authentic Chinese street foods to the numerous Chinese students attending local colleges and universities,” and to “represent Chinese culture and history through foods and conversations.” O’Crepe is a food truck that serves both sweet and savory crepes to Rhode Island. Mamitas is a truck that aims to serve delicious and authentic latin food. Taste the World was not just a cultural experience for your mouth, but also designed to tantalize all of the senses. There was music from a wide range of cultures, as well as cultural dance performances by URI groups eXposure and Alima International Dance Association. The event was also in partnership with 193 Coffeehouse, which provided a free personalized mug that got free coffee from 193. The mug personalization process involved a typist who types out what you want on the mug, that gets printed out and taped around the mug and then the mug got sent to baking machines that use heat to bake the image and text onto the mug. Students who got mugs were allowed to present it to the 193 Coffeehouse, who would then fill the mug with free coffee for the day. Taste the World not only was a fun and lively way to kick off International Education week, but also to bring attention to the upcoming events for the week as well as to get students thinking about study abroad options. Some of the big events are Apply for or Renew a Passport at URI from 10 a.m. to 2 p.m.on Wednesday, Nov. 15th, Ping Pong for Peace, 11 a.m. to 3 p.m. Thursday, Nov. 16th and Diwali at 6 p.m. on Saturday Nov. 18th. While many students came for the free food and drinks, many left feeling physically and culturally full.